RocSupport is an easy-to-use software tool for estimating deformation in circular or near circular excavations in weak rock and visualization of the tunnel interaction with various support systems. Given the tunnel radius, in-situ stress conditions, rock parameters and support parameters, a ground reaction curve and a support reaction curve are calculated. The intersection of these curves determines a factor of safety for the support system. RocSupport can be used as a tool for the preliminary design of tunnels and support systems. It can provide valuable information about various tunnel support options before detailed analysis is carried out with a finite element program such as RS2. The program is applicable to tunnels excavated in weak rock under squeezing ground conditions. It is not applicable for excavations in hard rock, where failure is controlled by structural discontinuities or brittle failure. The Vrakas and Anagnostou Method (2014) is especially beneficial, as it is used for tunnels with large strain. RocSupport v4.0 also incorporates an updated Project Settings dialog with a Sampling, Random Numbers, and Project Summary tab, for convenience in modeling. Additionally, when using a solution that uses the Mohr-Coulomb failure criteria, the user now has the choice of specifying the rock mass strength properties in terms of either cohesion or compressive strength. Another notable change in the new version of RocSupport can be found in the Support features. The user can now define a custom type of a support by using the “custom” checkbox in the tab of a specific support type (e.g. a custom type of rockbolt). Additionally, a database of common reinforcement types has been added for custom steelset support, to assist with the input of reinforcement properties. The database contains over 1000 entries. 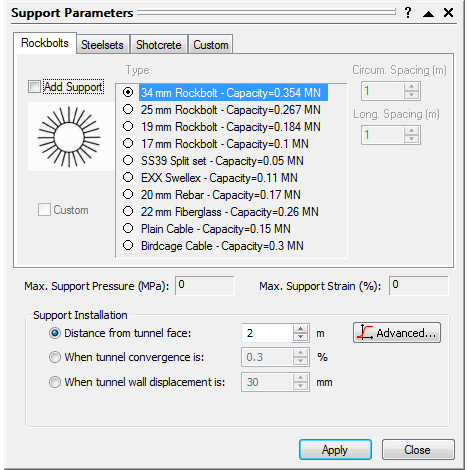 RocSupport allows you to simulate the application of rockbolts, steelsets or shotcrete around the circumference of the tunnel. Within each support category, you may select from one of several predefined support types, or create a user-defined custom support. Each specific support type has an associated maximum support pressure and maximum average strain. You can combine more than one support type in the same model. If none of the predefined support types is suitable for the project, you can to define your own custom support type. This allows you to specify any combination of Maximum Support Pressure and Maximum Average Strain, which will define the support reaction curve. 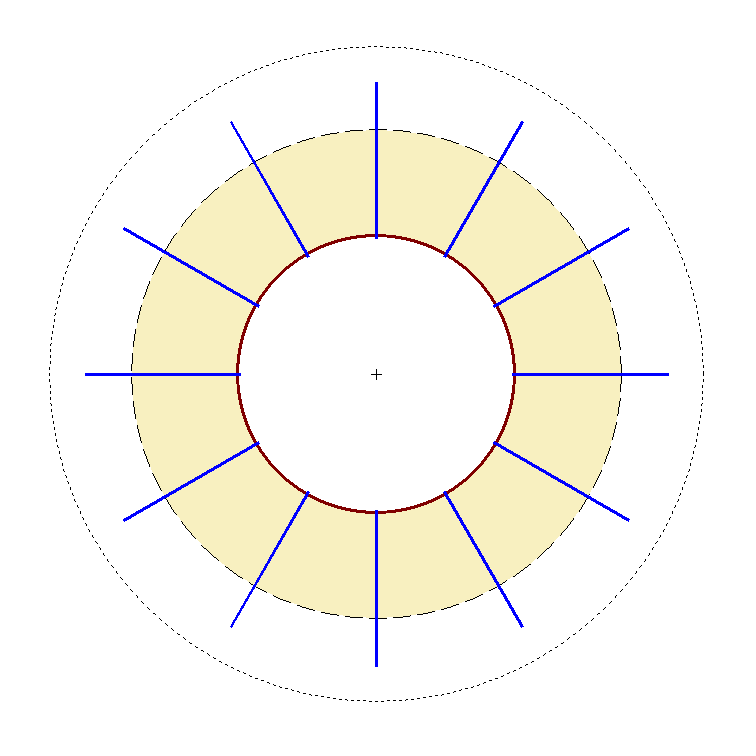 The final required parameter is the point at which the support is installed, relative to the advancing tunnel face. This determines the origin of the support reaction curve on the rock-support interaction plot. The solution methods in RocSupport compute the Ground Reaction Curve based on initial assumed material properties and loading conditions. To account for long term tunnel behaviour (e.g. rock mass property deterioration, re-establishment of groundwater regimes, creep, etc. ), a strength reduction factor can be applied to obtain a long term Ground Reaction Curve. 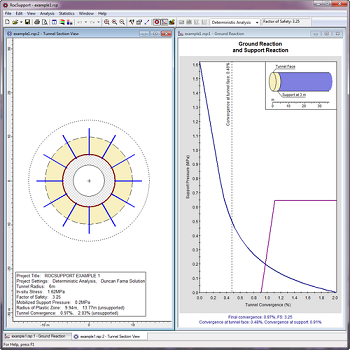 RocSupport can perform Deterministic or Probabilistic analysis. For a Deterministic analysis, all input values are assumed to be exactly known, resulting in a unique ground reaction curve and factor of safety for the support system. For a Probabilistic Analysis, you may enter statistical distributions for input parameters (e.g. Tunnel and Rock Parameters). This results in a distribution of safety factors, from which a probability of failure for the support system can be calculated. See the RocSupport Probabilistic Analysis page for more information. At the heart of the “rock support interaction” analysis method used in RocSupport is the “ground reaction curve” or “characteristic line”, which relates internal support pressure to tunnel wall convergence. The RocSupport solution methods compute the Ground Reaction Curve based on initial assumed material properties and loading conditions. To account for long term tunnel behaviour (e.g. rock mass property deterioration, re-establishment of groundwater regimes, creep, etc. ), a strength reduction factor can be applied to obtain a long-term Ground Reaction Curve.